The IDC'2018 conference will be held at the Bizkaia Aretoa building located in the center of Bilbao, Bizkaia, Spain. This building is located in one of the most emblematic parts of Bilbao. L-shaped, it opens out onto the estuary and the Guggenheim Museum, right in the centre of Avenida Abandoibarra, between the Padre Arrupe footbridge and the bridge known as the Puente de Deusto. It has a constructed surface area of over 9,000 square meters, spread over six floors. 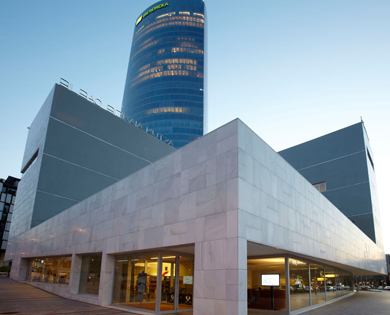 The 2,300 m2 ground floor provides a space for the building's main auditorium, Mitxelena, with room for 441 people, a large 400 m2 foyer, two meeting rooms and a spacious gift shop. The first, second and third floors have an area of just over 1000 m2 and will house the offices of the Vice-Chancellor and the Governing Council, two conference rooms for 161 and 66 people, five exhibition areas and offices for several services of the university. In addition, the building has in its first floor a 400 m2 terrace with amazing views. In the basement there is a car park and several storage rooms. Nowadays, this building hosts all kind of social, cultural, academic and scientific events. Most of them are organized by the UPV/EHU, but there are also a few organized by external entities. Due to this, Bizkaia Aretoa has become in a reference place for the field of events in Bilbao. By underground (metro): The nearest stop is Moyua (exit for Ercilla-Guggenheim). From the exit, walk down Calle Elcano towards the estuary (in the direction of Abandoibarra), keeping the Government House building on your left, and when you come to the Euskadi roundabout, turn into Calle Ramón Rubial and continue until you come to the Bizkaia Aretoa building. It is about a ten-minute walk. By tram: The nearest stop is Guggenheim, which is right by the Bizkaia Aretoa building. It is about a one-minute walk. By car: The nearest carpark is Parking de la Plaza Euskadi (in the sqare of the same name). The entrance is in Calle Ramón Rubial. It is about a two-minute walk. Renfe: Abando station (also known as 'Estación del Norte') has a link to the underground (you should take any underground train from the platform for trains bound for Plentzia) and the Abando tram stop is right near there (take a tram bound for Basurto). Should you wish to walk from this station to the Bizkaia Aretoa building, the journey would take just over 20 minutes. FEVE: La Concordia Station (also known as 'Estación de Santander') is next door to Abando Station, and therefore the same routes mentioned above can be used to reach the Bizkaia Aretoa building from here. Arrivals at Termibus: It is possible to walk to the Bizkaia Aretoa building from Termibus in about 20 minutes or else to take the tram bound for Atxuri from the San Mamés tram stop. Arrivals at Bilbao-Loiu Airport:: To reach Bilbao from the airport, take the A3247 Bizkaibus, catch a taxi or hire a car.